It is no longer news that blackberry is preparing to launch its own android powered device called Blackberry Plague in August. 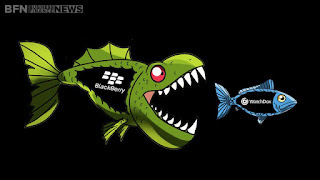 Ever-since the announcement, there has being widespread rumor of Blackberry Ltd. shutting down or being sold out. Continue after the cut. BlackBerry Ltd. Chief Executive Officer John Chen confirmed in an interview that the company "may be forced to stop making smartphones if turnaround efforts fail to gain traction". BlackBerry’s smartphone revenue according to him, fell 31 percent to $263 million in the most recent quarter from a year earlier. If the current state continues for a “long time” and drags down the company’s shareholders and balance sheet, it wouldn’t be right to keep going, Chen further said. According to him, Blackberry Leap which was unveiled recently being one of the low-cost devices aren’t likely to be part of a profitable BlackBerry device business. I see people zoning over to Android OS or iOs platform in the next quarter of the year. Now that blackberry is bowing out of the market, what will happen to BB fans across the world?